MindWare is an award-winning creator, manufacturer, and distributor of Brainy Toys for Kids of All Ages. Their diverse product line includes games, puzzles, brainteasers, arts and crafts activities, mysteries, mazes and more. Their goal is to place high quality toys that teach and entertain into the hands of children and adults. I generously received Gears! Gears! Gears! 150 Pieces in a Bucket from MindWare. Get their gears turning with this perfect introduction to building toys! The colorful set has 150 snap-together pieces that make a caterpillar, race car or zigzagging stairs. Gears! Gears! Gears! 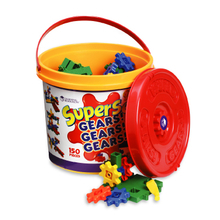 150 Pieces in a Bucket includes gears, pillars, connectors, cranks and inter-locking building-base plates in a giant storage tub. Activity Guide also included. My son loves to build things so I knew he would love these Gears, Gears, Gears! He is only two (and they are made for 3+) so it took him a little while to catch on but after working with my hubby for a couple minutes, he caught on and has loved playing with them ever since! I don't know who liked playing with them more - my hubby or my son! :) The engineer in my husband definitely came out and he was having a blast making all the gears spin together! The only thing I didn't like is that the lid on the bucket doesn't stay on well or lock into place so it makes storing it difficult! I just wish the lid didn't fall off so easily - it would save my son and I a lot of headaches when we are trying to put it away! If you are looking for a unique toy that helps your child reinforce their counting & sorting, help develop their fine motor/finger strength and have fun all at the same time, then make sure to check out Gear, Gears, Gears! It is sure to provide hours of fun and learning for your child! It provides a nice change from other regular blocks and building toys! Buy It: You can purchase Gears, Gears, Gears (150 pcs) for $49.95 on the MindWare website. awesome review! my boys would love those!